NEW YORK – On Thursday night in the Bronx, the Regression Monster clawed back at CC Sabathia, whose stellar work over his previous three starts had been one of several factors in the 17-1 surge that allowed the Yankees to overtake the hot-starting Red Sox and claim sole possession of first place in the AL East. Though no longer able to muster the 95 mph fastball of his heyday, Sabathia’s remade repertoire — along with the smoke and mirrors produced by a .211 batting average on balls in play — had helped him to a 1.39 ERA entering the night, the league’s second-best mark among starters. Alas, the Red Sox teed off on a handful of pitches that Sabathia called “probably too good to hit with two strikes” and allowed a season-high four runs in a rain-shortened four-inning start. The Yankees’ 5-4 loss brought their eight-game winning streak to a halt and at least temporarily ended their sole occupancy of first place in the AL East. Though Sabathia netted a season-high 15 swings and misses against the Red Sox, he was peppered for nine hits, three of which never left the infield — death by BABIP. Just after he served up a solo homer to Hanley Ramirez to start the fifth, putting the Yankees in a 4-0 hole, the skies opened up and drenched the playing field, causing a 55-minute rain delay and ending the 37-year-old southpaw’s night after just 80 pitches. The Yankees lineup, though held to just one hit by Sox starter Eduardo Rodriguez and reliever Matt Barnes over the first six innings, rallied to tie the game in the seventh, only to fall behind for good via J.D. Martinez’s eighth-inning solo homer off Dellin Betances. “I felt pretty good, maybe a little too aggressive a couple times with two strikes,” said Sabathia afterwards. Indeed, while he had held opposing batters to a .159/.183/.261 line with two strikes (the AL average is .175/.247/.280), five of the nine hits he surrendered were two-strike hits. Each one led to runs: Mookie Betts‘ game-opening ground rule double, the three straight third-inning hits by Betts, Andrew Benintendi (a double), and Ramirez that keyed a two-run rally, and Ramirez’s solo homer. “They dinked in some hits and they hit some balls pretty hard. It was just one of those nights,” said Sabathia, who had yielded just four runs (one earned) over his previous four starts and 23.1 innings since coming off a disabled list stint for right-hip soreness. With his night, his ERA climbed to 2.23 and his BABIP shot to .255, while his FIP barely budged, from 3.60 to 3.63. But one rough outing doesn’t undo the larger story of Sabathia’s recent success and late-career reinvention any more than one mid-May loss to the Red Sox will derail the Yankees’ playoff hopes. Sabathia’s resurgence started in late 2015, when he began wearing a bulky brace under his uniform to support a right knee hobbled by bone-on-bone arthritis. Over his final five starts, including the win that clinched the team’s Wild Card spot, he posted a 2.17 ERA, but by the time the AL Wild Card Game was played five days later, he had checked himself into an alcohol rehabilitation facility to address a drinking problem that gotten beyond his control. Thankfully, that’s a battle he appears to be winning. Last year, righties hit .242 and slugged .382 when putting the cutter into play, and entering Thursday, this year’s numbers were about the same (.220 AVG/.390 SLG), but he’s got higher whiff and whiff-per-swing rates this time around (from 7.7% and 15.6% for 2017 to 10.8% and 20.7% in 2018, respectively). 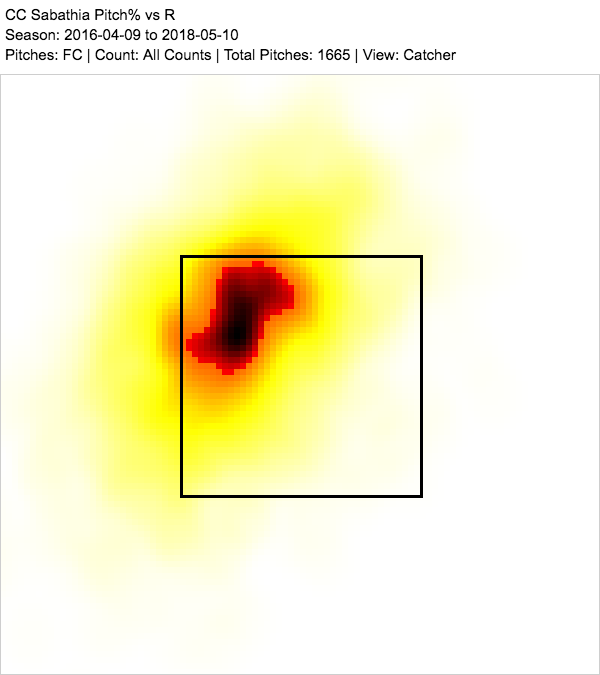 Overall, Cutter Era CC is getting batters to chase pitches outside the zone at a career-high 35.8% rate and has missed bats with the same frequency as the once-durable pitcher — the one who averaged 214 innings from 2001 to -12, with at least 180 every year — who limped through 2013-15, having not only undergone post-2012 removal of a bone spur in his elbow, but mid-2014 surgery to his right knee to debride cartilage and remove a cyst. Though he’s still capable of pitching six or seven innings in a good start — as he had done in each of his three outings before Thursday — Sabathia has had to accept the possibility of a fifth-inning hook on his lesser nights, part of a larger trend teams have created to shift workloads towards their increasingly well-stocked bullpens. Sabathia made headlines earlier this week when he told the New York Post that he would retire if the Yankees won the World Series. “I want one more parade and pretty sure that will be it,” said the 37-year-old southpaw. “I thought I had it last year.” Given the physical and mental toll of the seasonal grind (and the grind in his knee), one can understand why, even in the midst of this reinvention, he might not have the fire to pitch until he’s 40, particularly when he has four children at home. But if he does bow out after 2018, he’ll leave a couple of major milestones on the table, milestones that may not be reachable this year but could easily be reached next year, and which in turn could enhance his chances at election to the Hall of Fame down the line. Sabathia is at 239 wins, and while 300 is probably unreachable unless he has Bartolo Colon’s staying power, 250 feels close. While averaging just 5.5 innings per start last year, he notched 14 wins thanks to 5.2 runs per game of support and the backing of one of the game’s best bullpens; only once did his relievers cost him a win. This year, with just 5.2 innings per start, he’s getting 4.2 runs per game of support on a team that’s averaging 5.8 overall, and so despite his excellent run-prevention, he’s notched just two wins. Here it’s worth pausing to note that no, I really don’t care about pitcher win totals, and you needn’t care, either, but BBWAA Hall of Fame voters are still quite attached to them. Since the election of Fergie Jenkins (284 wins) in 1991, they’ve honored only three starters with fewer than 300: Bert Blyleven (287, after a 14-year stay on the ballot), Pedro Martinez (219) and John Smoltz (213, plus a mid-career stint as a closer). Mike Mussina (270) and Curt Schilling (216) have both passed the 50% threshold in voting, suggesting they’re on their way before the end of their 10-year ballot runs; the late Roy Halladay (203), a two-time Cy Young winner who becomes eligible next year, may beat them there. It’s still a short list. The other milestone within Sabathia’s reach is 3,000 strikeouts. With five on Thursday, he’s up to 2,874, good for 17th all-time and third among lefties behind only Randy Johnson (4,875) and Steve Carlton (4,136). He won’t catch either of them, and his strikeout rates relative to the league aren’t in the same ballpark — via my hand-cranked K+ stat, which indexes strikeouts per plate appearance to the league average, Johnson is at 175, Carlton at 135, and Sabathia at 111 — which is to say, 11% above league average — but being the third lefty to 3,000 would be pretty cool. If he maintains his current rate of 6.9 strikeouts per nine thorough 162 innings (he’s averaged 165 over the past three), he’d add another 97 strikeouts, bringing him to 2,966. As I’ve noted previously in the context of writing about the Hall of Fame cases of Halladay, Felix Hernandez, and Johan Santana, at some point, BBWAA voters will have to reckon with the pitchers who spent their entire careers in the “workload constraint era,” with its five-man rotations, pitch counts, times-through-the-order concerns, and de facto innings caps. The milestones and resumés by which voters have been guided previously will look quite different from starters of past decades, and recognizing the best pitchers form an era that’s likely to lack of 300-game winners pitchers will require some mental recalibration. Beyond WAR, Sabathia’s got a Cy Young award, six All-Star selections, and a 113 Hall of Fame Monitor score — a Bill James creation that dishes out credit for milestones, league leads in key categories, and postseason work — where the average Hall starter is around 100. His postseason efforts in Cleveland, Milwaukee, and New York have amounted to a modest 10-6, 4.20 ERA line with highs (he was the 2009 ALCS MVP and posted a 1.98 ERA in five starts en route to a World Series ring that year) and lows (he had three non-quality starts in 2007, when the Indians fell one win short of the World Series, and lasted just 3.2 innings in the 2008 Division Series, after he carried the Brewers on his back to their first postseason in 26 years). Another championship would boost his Hall chances incrementally, particularly if he has a big postseason moment or two, but it must be conceded that his climb to Cooperstown is an uphill one. 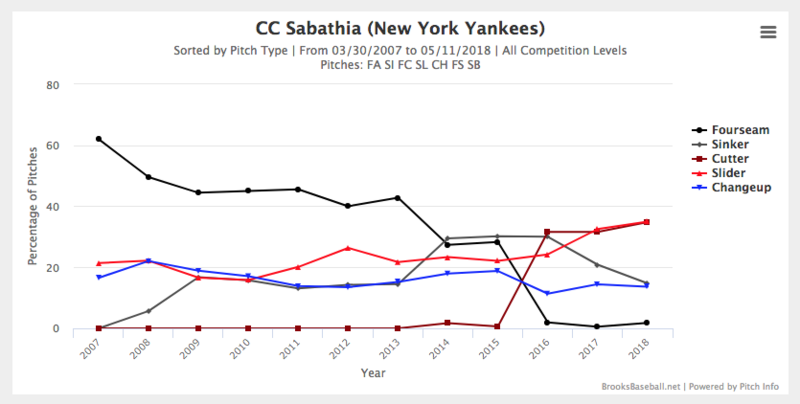 That said, Sabathia’s Yankees certainly do have a fighting chance at sending him out on top. Our Playoff Odds give the team a 14% chance of winning the World Series. But whether or not they reach that pinnacle and send the big lefty into the sunset, it’s worth savoring the work he’s doing right now, and the long road he’s taken. We hoped you liked reading The Reinvention of CC Sabathia by Jay Jaffe! It never gets as much attention because it was out in Milwaukee, but the half-season he had with the Brewers was just unfathomably good. Despite only arriving in July, he led the NL in complete games (7) nearly led the team in wins (11) and and was only 30 off the team lead in strikeouts, despite facing 300 fewer batters than Ben Sheets. In 17 games he produced 5.2 WAR (also team best) His ERA+ with the Brewers was 255 (which would be the 8th best single season all-time).